Hammer Away! by Discovery Toys offers toddler-sized marble run and a pounding bench. If he loves all that pounding action, what would his reaction be to a toy that put the fun of both those favorite activities together? You’re right, he’d be thrilled. That’s exactly what this incredible toy does. 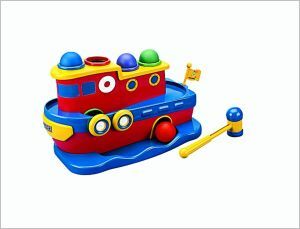 It’s a fun, brightly colored boat that comes with a hammer and four bright round balls. The balls get fitted onto the top of the boat, your toddler hammers picks up the hammer and whack! Down the ball goes into its slot. But that’s not all. The ball goes down, down, into the dark depths of the boat, then pops out on the foredeck, circles around, dips down into the hold, and reappears on the adjoining blue waves. What are my child’s favorite things about this boat? Half of it might be the visual appeal; the whimsical boat shape, complete with everything a boat might need; the funny little flag that can be turned to stop the balls; the blue waves rolling underneath. Perhaps the bright colors are also subconsciously appealing. But then there’s the play value; this boat is just so fun to play with. A tiny toddler can have fun just pushing the balls through the holes in the top; a bigger child will enjoy pounding, pounding, pounding and then watching the ball disappear—appear—disappear—and appear again. This boat is bulky, but in toddler terms that is wonderful: as far as my little boy is concerned, a toy needs to be a certain size to be really cool. What are mom’s favorite thing about this boat? First off, it helps my child learn and explore in fun, open-ended, imaginative way. It helps him develop coordination, increases the strength in his fingers, hand, and arm, and improves his fine motor skills. It also gives his brain a workout, and helps him with cause-effect thinking and problem solving. And then it’s just fun for the toddler, and whatever is fun for the toddler is fun for the mom. What mom won’t appreciate a toy that can entertain her little one for hours at a time? There’s another aspect of this toy I appreciate as a mom: the boat is BPA-free and made to the highest safety standards, so I don’t need to have any worries about my child’s extended hours playing with it. What’s Wrong With the Hammer Away Boat? To be honest, I haven’t found much. This toy does make a lot of noise; after all, your toddler will be hammering away most of the time he plays with it. That goes with the territory; but you may want to have rules about when loud toys can be played with; and put this one away during ‘quiet hours’. My other ambivalent point is that the balls are so easy to lose! That is not the manufacturers fault, of course, but it is a downfall of any multi-piece toy. You can store the balls nicely on the top, though, and if you do happen to lose them you can order replacement balls from the manufacturer for fairly cheap. On the whole, though, this should make a much loved toy for any toddler!